exhibits the highest professional and personal standards set by Rotary International. Ms. Morado was presented this award at a special ceremony on June 30 at the McAllen Country Club in recognition of Ms. Morado’s “service in furthering understanding and friendly relations among peoples of the world”. Rotary International was founded in 1905 and based in “fellowship and friendship” and now has over 200,000 members in 75 countries. 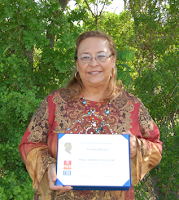 Ms. Morado serves as County Extension Agent in Starr County and works for Texas AgriLife Extension Service. She has served South Texas as an Extension educator for more than 30 years and was also recently recognized as a Regent Fellow by the Texas A&M University System Board of Regents. “Ms. Morado is the embodiment of a servant leader” commented Dr. Ruben Saldana, District Extension Administrator. “She leads by serving and she has made an indelible mark on our part of the state” he continued.